A new addition to our Royal Ceremonial Dress Collection, this velvet and silk child’s dress was worn to celebrate the wedding of the future Edward VII; Prince Albert Edward, the eldest son of Queen Victoria and Princess Alexandra of Denmark on 10 March 1863. 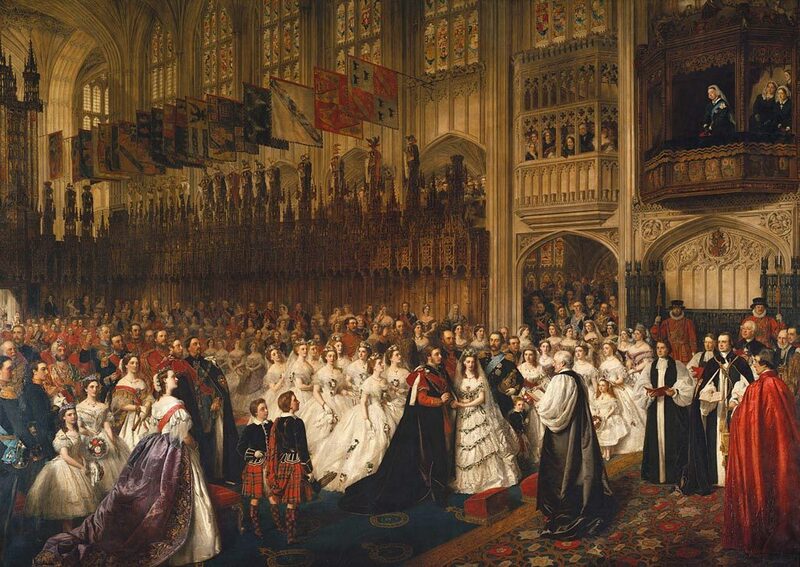 In the words of curator Claudia Acott Williams ‘The wedding was cause for great public celebration. The couple were popular with the British public and gradually came to fill the gap left by the Queen’s absence from public life after the death of Prince Albert’. 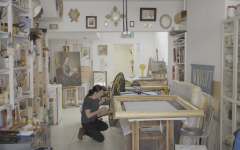 In this blog post conservator Viola Nicastro will give you an insight into what it took to conserve and prepare this dress for display in the current ‘Victoria Revealed’ exhibition at Kensington Palace. This dress is made for a child of about eight years old and is of very fine silk velvet embellished with ivory satin piping with glass and shell buttons. It is therefore highly likely that a member of a very wealthy family would have worn it. The silk sash is decorated with the Prince of Wales’s heraldic symbols: three-feather plumes and the words ‘Ich Dien’, German for ‘I serve’, that were stamped with ink at the bottom. 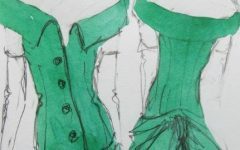 When I first assessed the condition of this dress, I noticed staining on the front of the bodice and the skirt; I could picture in my head a naughty child getting messy whilst eating at the celebratory party, leaving marks that will always remain. The silk sash also had dirt and water marks. Unlike other items in our collection which we can wash, it was not safe to expose the ink stamp and the fragile velvet of this dress to water. I had to find other ways to clean it and contain the treatment to the stained areas only. Preliminary testing showed that staining on the velvet could only be reduced slightly, as it has chemically affected the dye in this area. Testing on the sash gave me a bit more hope, as IMS (Industrial Methylated Spirit), a solvent solution often used in conservation cleaning, was successful in reducing the staining. However, I had to be careful to protect the ink stamp from making contact with the solvent as the oily component of the ink is soluble. I positioned the sash on a suction table, isolated the area I needed to clean with blotting paper and applied lines of wax to surround the ink stamp as a barrier layer. This wax is applied via an electric batik pen and evaporates after four weeks leaving no residues behind! Microscopic pictures prove the success of the treatment. Did you know that a child could wear a petticoat? In the 1860s, children’s fashion was as important as adults and contemporary magazines feature fashionable women surrounded by children wearing dresses of a similar shape to this one. See if you can spot the child in white in the painting above, you can see that the skirt looks really full and has a slight kick at the back. The sleeves are also slightly puffed. If I had put the dress on the mannequin as it was, the skirt would have looked flat. Costume mounting has a double purpose: to support the dress for preventing tensions and creases, and to create an accurate historical shape. It took me a while to build up the shape and I had to make a few petticoats to create the volume of the skirt. Can you guess how many there are? Have a look at the time-lapse video above to find out. Don’t miss this and other incredible objects on display at Kensington Palace as part of the Victoria Revealed exhibition. 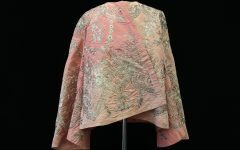 If you want to find out more about how we look after the Victorian objects in the Royal Ceremonial Dress Collection, have a read of our blogs on Queen Victoria’s petticoat and Queen Victoria’s Pink Jacket .